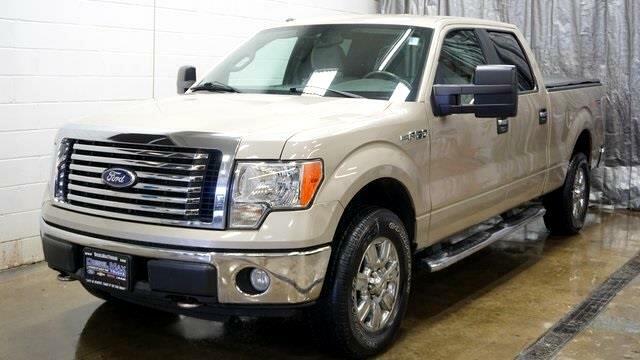 2010 Ford F-150 XLT 4X4 CARFAX One-Owner. Clean CARFAX. 4D SuperCrew, Preferred Equipment Package, 5.4L V8 EFI 24V FFV, 6-Speed Automatic Electronic, 3.73 Ratio Limited Slip Axle, 7,700 GVWR Package, Power Adjustable Pedals, Max Trailer Tow, Trailer Brake Controller, Power Heated Signal Manual Telescopic Fold Mirrors, Pick up Box Acess Step, Rear View Camera, Reverse Sensing System, XTR Package, Chrome Step Bar, Fog Lamps, 18" Chrome Clad Wheels, Keyless Entry Key Pad, Power Drivers Seat, Chrome Front and Rear Bumpers, Chrome Bar Style Grille, Tie Down Hooks Pickup Box, Rear Privacy Glass, Tailgate Lift Assist, Removable Tailgate with Lock, Display Center with Outside Temperature and Compass, Sirius XM Satellite, Tachometer, 4x4 System, Air Condition, ABS, 4 Wheel Power Disc Brakes, Engine Block Heater, Remote Keyless Entry, Heavy Duty Shocks, Tilt Steering and Cruise Control, Power Windows/Door/Mirrors, 2nd Row Power Windows, Driver and Passenger Air Bags, Side Air Bags. Odometer is 47660 miles below market average!